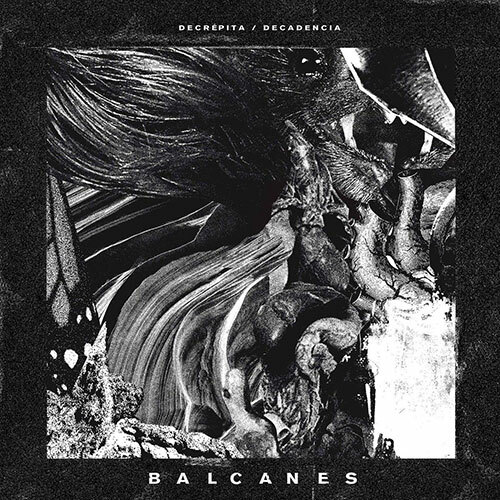 Balcanes: Decrépita b/w Decadencia 7"
Balcanes is a band from Humo, Spain who formed in 2014, from the looks of things. Balcanes play a devastatingly blown out style of music that incorporates elements of punk, noise rock, and death rock within their sound. Musically, Balcanes can be said to be influenced by bands such as The Jesus Lizard, Cult Ritual, Neon Blud, The Ukiah Drag, and other like -minded bands. Since forming in 2014, Balcanes have released a two song EP titled "Platforma/Autopista" in February of 2014 and a five song 12" titled "Carne Nueva" in October of 2016. "Decrépita / Decadencia" is the band's latest two song 7", which was released via Pifia Records on September 11th, 2017. On "Decrépita/ Decadencia", Balcanes offer up two tracks of dark, moody, and blown-out sounding punk, noise rock, and death rock. Overall, "Decrépita/Decadencia" makes for a great listen. Black vinyl in black/white sleeve with insert.